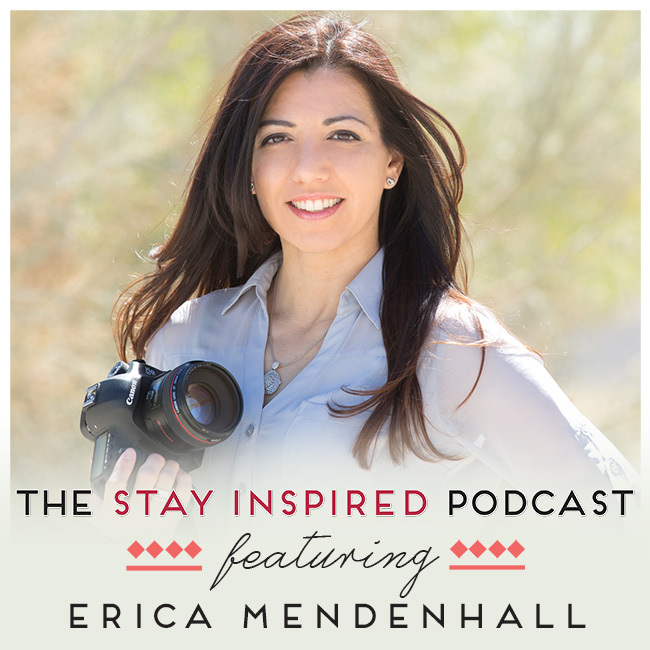 Today on The Stay Inspired Podcast, we’re featuring the award-winning photographer Erica Mendenhall. Erica is an expert in the lifestyle and wedding photography industry. Today she shares with us how you can find and capture inspirational images and scenes, using anything from a professional camera, to an iPhone, from Microsoft Word to Pinterest, and more. In this episode we talk about many topics, from how Erica works with her clients to find their inspiration, to her experience as a professional photographer, why we as women all deserve greatness and how you can create beautiful images for your Joyful Life Vision Board. While in college, Erica founded Erica Mendenhall Photography, and since then her photos have been featured in numerous publications, including Theknot, Desiree Heartstock, Borrowed & Blue, Knotsvilla, and Love and Lavender. I’ve also had the pleasure of working with Erica to help capture some of my most special moments. She is absolutely wonderful and I am so excited for you to spend this time with us! What inspired Erica to become a photographer? Download and Print my Joyful Life Vision Board PDF –.This is for you to create a place to show off your visions and your dreams. Use this with the advice from today’s podcast for an amazing way to decorate your space!